Just around the beginning of September (or more specifically, after the first soaking rain at the end of the summer) there’s a tangible excitement in the air. Old men poke their heads out to observe the sky and note the wind, they gather in bars and talk amongst each other in hushed voices. They know the fungi (fhun-gee, mushrooms) are on their way. My Fabio is one of them. love (or should I say spores) are in the air! It’s fungi season! My husband’s family have always been big mushroom lovers. It’s a tradition passed down from generation to generation (his grandmother was especially adept at finding them), as are the closely-held, secret locations where they go to forage. These locations are so highly protected that, say, you brought a friend along one year to your ‘spot’ to go foraging together: if you learn that said friend returned to your spot without bringing you along, it’s considered the ultimate betrayal and the friendship might be over. This is especially true with the coveted porcini mushroom, where, as my father-in-law once put it “going back to someone else’s spot without him is like sleeping with his wife.” So yea, you get the idea! Along with the location, the knowledge of where and when to find different varieties is also passed down carefully from father to son (or in my case, to the American daughter-in-law). I don’t pretend to know a lot. Honestly, in the beginning I was a bit scared about the whole ordeal. One of the first books I remember reading over and over again was Babar the Elephant. Remember him? The cute little elephant whose dad died eating wild mushrooms?! But, thankfully, close attention is always paid when identifying mushrooms, and a skilled hunter knows all varieties, the edible and the poisonous. When harvesting, there are some rules to be followed. You must gather your mushrooms in a wicker basket, that way the spaces in the bottom allow spores to fall out, thus ‘spreading their seed’ around so you’ll have more to hunt next year. Second, you must cut the mushroom towards the base of the stem with a pairing knife, leaving the root the mushroom intact allowing it to produce more in the future. These old secrets are beautiful in that they are made so there is a harmony with nature. Man takes, but he also makes sure to leave a little for next year. This approach to food, as well as the symbiotic way of thinking in relation to nature is so incredibly important but, unfortunately, for most of us in the U.S. is completely foreign. This last weekend, we went in search of pinaroli. These are orange-ish mushrooms with a thin stem and a wide-brownish-orange cap that tend to grow under pine trees. It’s a bit too early for porcini, which grow under the prized chestnut tree, but give us a few more days of rain followed by a few sunny days and we may be in business. 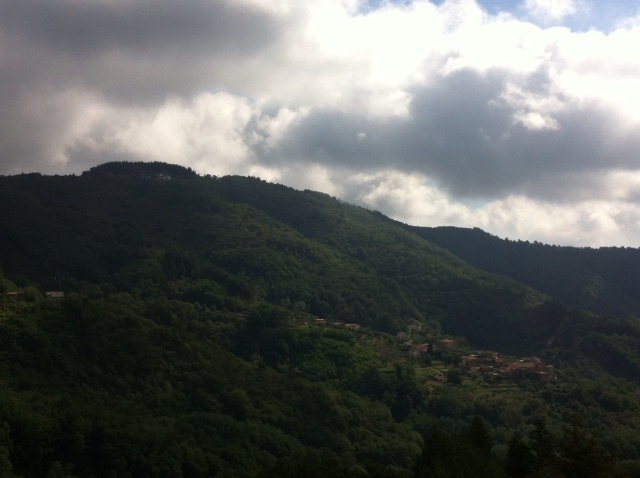 We headed up to the Appennine mountains, above Pistoia, to our traditional hunting grounds. Along the way we passed many a-car on the side of the road, a tell-tale sign of the season. Also, you see many man (usually aged 60+ wearing camouflage hanging outside of mountain bars). Fabio, being the crafty one that he is, sometimes goes into those bars and orders a coffee just to eavesdrop of their conversation to find out what kinds of mushrooms they’re finding. He’s resorted to espionage he’s so crazy about it! I usually don’t participate in the actual picking, I kinda like tromping around looking for them and then letting Fabio know where they are. We always take our dog with us so she can get to romp in the fresh, mountain air and we all have a pretty great time. Since we generally start in the early morning, by lunch we’re readying to come back down the mountain and enjoy the fruits of our labour. We typically eat them as a sauce for pasta or grilled with olive oil, garlic and parsley. There are many different types of sauces you can prepare, but my favorite is with rosemary, garlic, and some white wine (I’ll post the recipe the next time we make it, preferably with porcini). I have to say, because these guys are wild, the effect on the digestive system can be…shall we say… explosive. Especially the first taste of the season, so I usually have to kinda go easy on them. Obviously, I can’t recommend anyone going out there and trying this themselves without any experience because that can be really dangerous. As I mentioned before, careful attention must be paid, as some poisonous varieties are very similar in appearance to those that are edible. I remember seeing a story on the local news last year about a family who had somehow come across some bad batch and everyone but the youngest boy, who didn’t like mushrooms, tragically died. This highlights the importance of the wisdom passed down from the old-timers. They know the land more intimately than anyone, and if the information they have dies with them, then this culture that we know and love will slowly fade as well. And I have to say, I didn’t see anyone out last Saturday, with the acception of Fabio and myself, who were under 50 (and I was definitely the only girl). 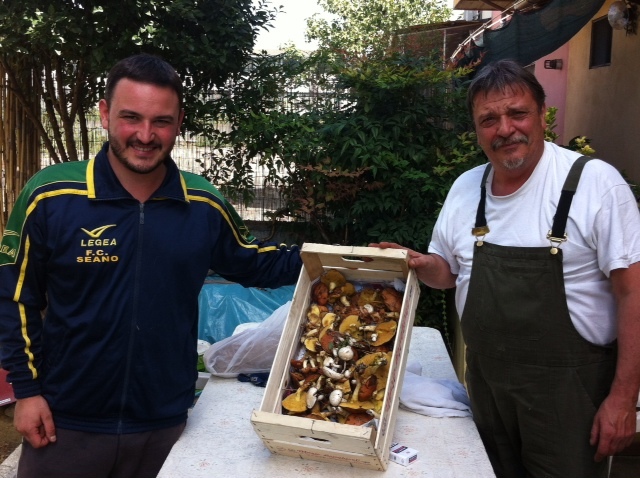 Word on the street is that there are porcini varieties to be found in California, and while I’m sure their locations are as secretly guarded as they are here in Italy, I’m determined to give my mushroom-crazy husband the opportunity to do what he loves in his new home. 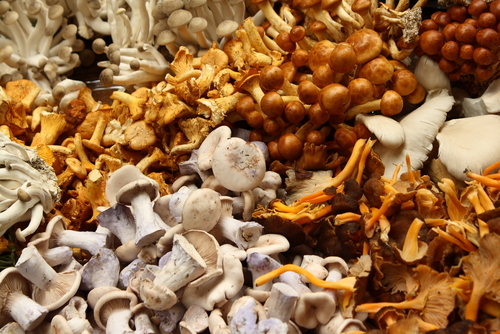 This entry was posted in La Vita Italia and tagged Apennine Mountains, Boletus edulis, California, Fabio, Italy, Mushroom, nature, pinaroli, Pistoia, porcini, slow food, United States. Bookmark the permalink. 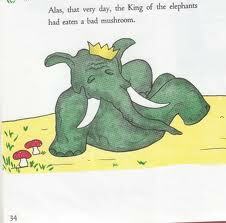 great post – and the fact that you mentioned Babar and his dad dying of eating wild mushrooms made me laugh so hard. You rock Katie! That stuff says with you, man!!! Glad it made you laugh!! Thanks for the support!! Ciao Jennifer! il piacere e’ mio! It’s so nice to know there are other women out there hunting those fungi down! I wish I could make ours last, my husband seems to eat them every day ’till there gone (which doesn’t take long)! Thank you so much for your kind words about the blog, I really owe Girl in Florence for motivating me to finally get cracking at it.